This is a small version of my popular bar soaps, perfect for sampling different scents, travelling, or guest use. In fact, I started making these by request for a local AirBnb owner, to provide in their rental cabins, such a thoughtful gesture! 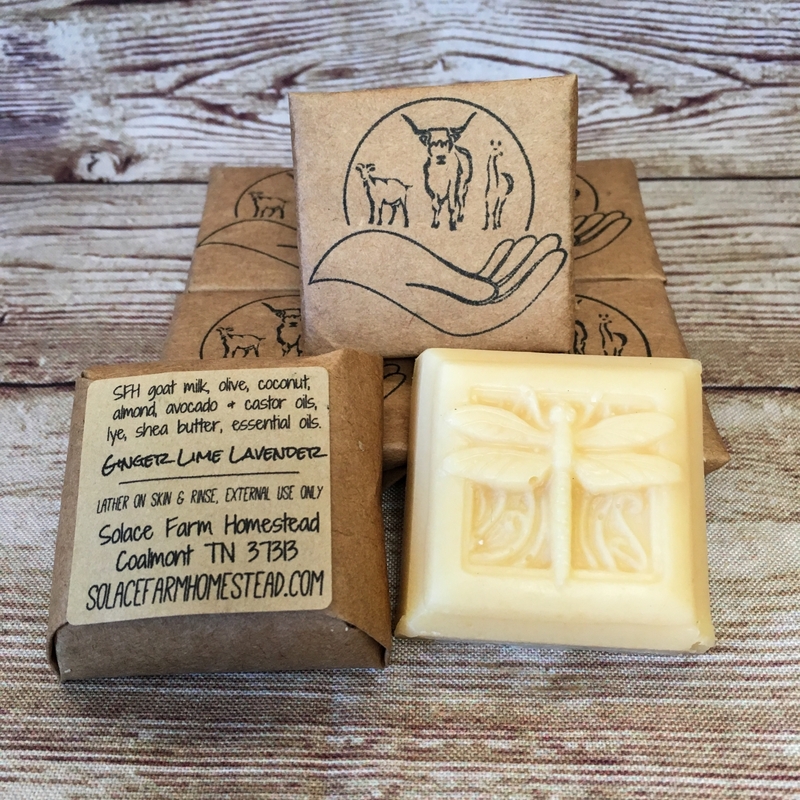 These lovely little handmade goat milk soaps or goat milk and lard soaps are approximately 1 oz, although they can vary between 0.7 and 1.2 oz, and are available in either a Tree of Life molded bar, or a Dragonfly molded bar, both wrapped in handcut brown paper with a label on the back with full ingredients (see photo) and a hand-stamped logo on the front. I don't always have both options for all fragrances, so if you strongly prefer one design, convo me first to check availability, otherwise I will send whichever mold that scent is currently available in. I make these in a variety of scents, both fragrances and essential oils, and completely fragrance-free as well, and am happy to make custom scents for you (with a 5 week lead time, please convo first). Goat milk is renowned for the luxurious qualities it gives soap, particularly gentle exfoliating and excellent moisturizing. 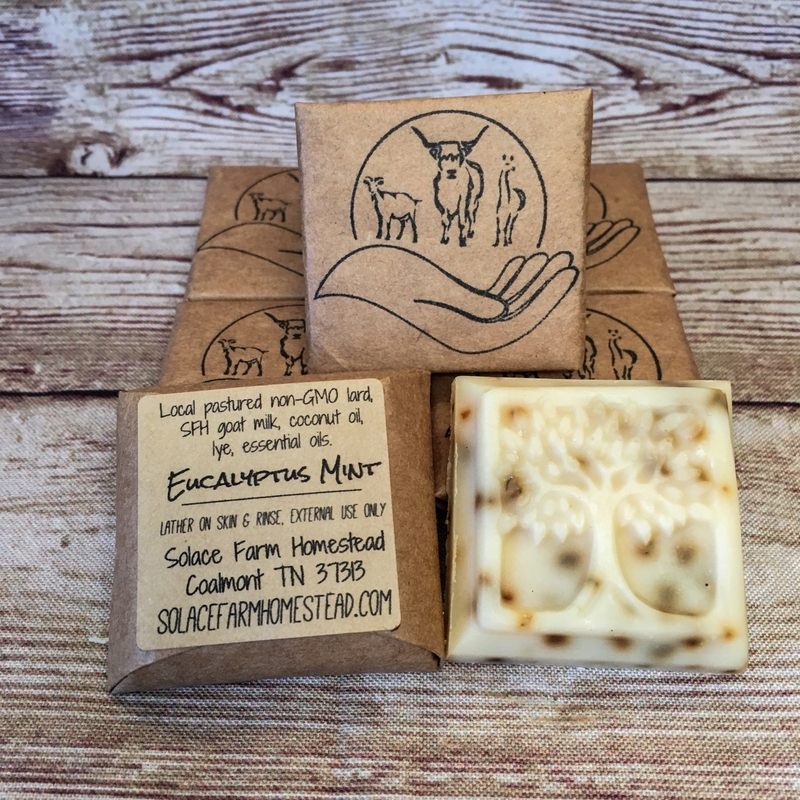 I hand-milk my goats Gretchen, Snowpea, and Elvira, and use the rich milk as well as olive and coconut oils, almond, castor, and avocado oils and shea butter to make this wonderful soap. I don't use Palm oil as many soapmakers do - while it itself is a useful oil, I can't condone the harmful cultivation practices used to produce it, and find I don't need it - this soap is wonderful without it! It is so moisturizing and good for your skin, with extra vitamins and nutrients from the goat milk, as well as the luxurious oils I use. 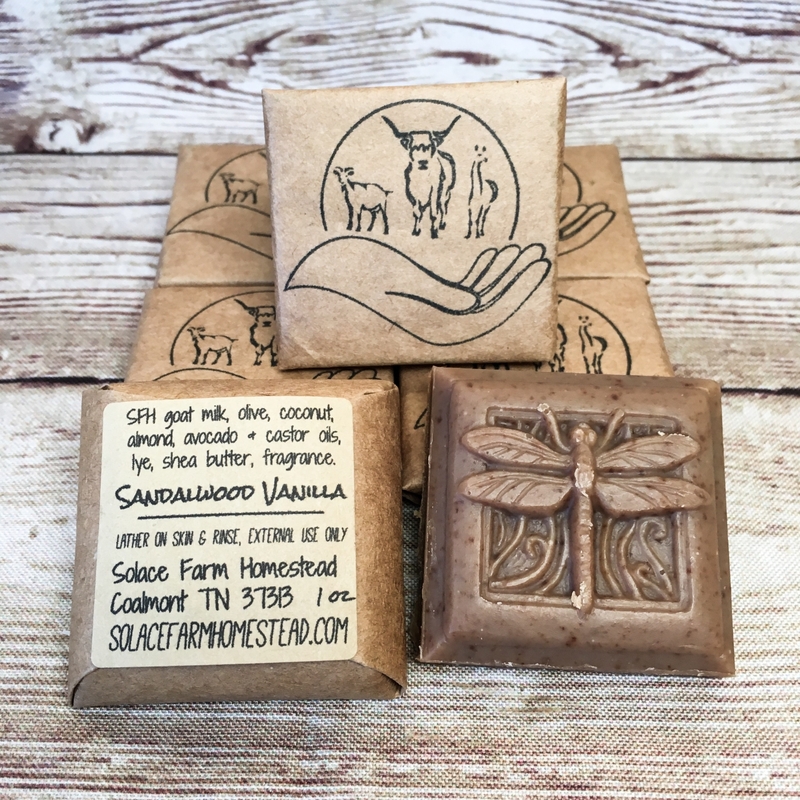 If you have used goat milk soap before, or any good handmade soap, you know that it is a completely different creature than commercial soap, which can be so drying! When soap is made by hand, the chemical reaction of oils with a lye solution forms the substances soap and glycerin (by the way, all soap is made with lye, otherwise it is a detergent). A typical bar of handmade soap is roughly 1/3 glycerin! This is a humectant, meaning it pulls water from the air - when on your skin, it literally moisturizes your skin by attracting water to it. In commercial soaps, the glycerin is distilled and removed, and later sold back to you in a lotion, but in the "real thing", it is all one package. I used to use lotions and moisturizers a lot, especially in the winter, but I virtually never use them anymore, other than some of my grass-fed tallow balm on my hands occasionally. I use local lard that I render myself from neighbor and fellow small-farmer Cove Creek's pastured, non-GMO-fed pigs. While lard soap often has a reputation for being harsh or rough on skin, that is largely because many years ago, lye was not consistently refined, and people didn't use precision measurements. Today, with 100% pure lye and my digital scale, lard makes a beautiful white soap, very hard and long-lasting, with good cleaning power, while being very gentle and soothing on skin. I have gotten great reviews, both in person and through my Etsy shop, about how wonderful this soap is for skin - gentle, moisturizing, cleansing, and no residue! Our motto here at SFH is “By Hand”, and we really mean it! 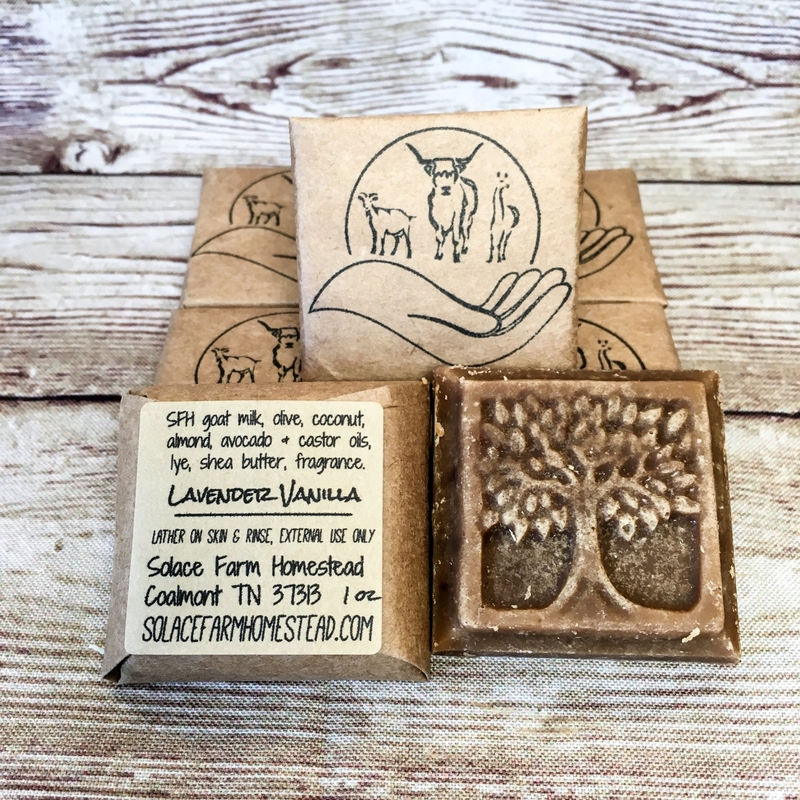 I make all my soap from scratch – I never use a purchased base - I milk my goats (and sheep) by hand, render the local lard myself (usually on our woodstove) and all my soap is made in my kitchen in small batches from 6 to 36 bars at a time. I only use great ingredients – no palm oil, soybean oil, canola oil, or any others with controversial cultivation, harvest, labor, or business practices, and nothing really exotic and expensive, so I can keep my costs down for you. I have a few recipes that are the best I could find – and then I tweaked them to meet my standards while maintaining the high-quality product (so my shampoo replaces the recipe's palm oil with local, pastured lard, and the expensive Kukui nut oil with avocado oil). Please scroll down to the bottom of the page on any of my items to read my "Additional Policies - About Lye Soap" for more detail on why you should use quality handcrafted soap! Other soap companies are just that – SOAP companies – but we are a small, family homestead that produces handmade soap as one facet of our diverse, small-scale farm so that we can both raise our 3 home-schooled boys and teach them how to love and care for the world around them through animals, gardens, and the joy, satisfaction, and confidence that comes from knowledge and capability. If you're interested in finding out more about our homestead, stop by our blog and photo galleries at SolaceFarmHomestead.com, or take a peek at our Instagram page, or pop over to our Facebook page - there are links in my Shop profile, just click on my avatar at the top left of the page. Thanks for checking out our products, and supporting small artisans and handcrafters!